Probably this is the easiest project in the book, and I certainly loveeverything about it! It's very simple but gives you a lot of room to be creative and make yours very unique! I closely followed the instruction except for the button on front.Instead of using a fabric covered button for it, I used a cutelamb button I found in my stash, just because I thought the lamb may feel better to be on there rather than sitting in the zip lock for another few years. lol! I happened to have a sewing-themed stamp of the perfect size,so I used it, but I must admit I had a bit difficulty stamping on the cotton tape. 1. If you have temporary fabric adhesive on hands, you might want to useit for the cotton tape and the lace placement instead of pinning them. I use this glue anytime it's hard to use pins (like sewing rick rack tapes etc. )It's much quicker and easier and, gives you better control! 2. When you leave an opening at a long edge to turn your pincushionright side out through, it might be better to avoid including the areathe lace is sewn. Does that make sense? This is especially if you are using something like a rick rack tapethat is hard to hand-sew. It is much easier to hand-sew toclose the opening if the lace part is already machine-sewn. 3. When you put ink on your stamp, it might be nice to use a Q-tip toclean the edges of the stamp to prevent from unwanted ink on the tape. 4. Small print fabric might work best for the cotton part of the front.I thought about using a big print for it and realized it would be too busywith the stamped cotton tape and all. Small print helps other features (cotton tape, lace and button) pop up, I think! Here is the schedule of this sew-along again! As you may have guessed, I have a giveaway for you! 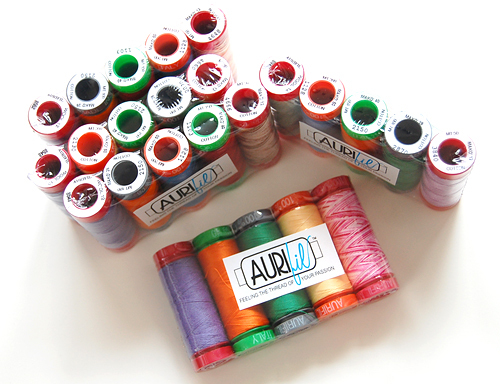 To win one package of 5 Aurifil threads, leave one comment for this postby the midnight April 20th. I will select 5 random winners and announce themon the day after. P.S. Make sure to link up your finished pincushion over Lindsey's by April 22nd for a chance to win the fat quarter bundle of Monsterz by Cloud 9 fabrics! I will definitly join this Zakka Style item ansd would love to participate in the give away as well! I've made my pincushion! Just need to get my post organised! oooh I love the addition of the stamped tape, so cute! Thanks for the chance to win some Aurifil, I've heard so much about this thread, would love to try it. The pincushion is so sweet. I need to buy this book!, I am so envious of your your projects guys. Thanks for the chance. Love your tute! Love your homemade stamp! Can't wait to try it myself! Hope I win the threads. I love your sewing machine stamp! Your pin cushion looks amazing too :) I'd love to enter your giveaway! Thanks for the chance. Oh Ayumi! You and Penny are trouble. I feel my resolve to avoid stamping on blocks totally weakening. You make it look so doable and the result so precious. Great tips are much appreciated. this is super cute ayumi! Pretty pincushion and I love your hand carved stamps!! 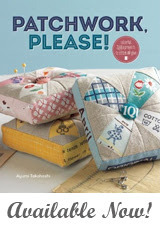 The more I see of these Zakka projects, the more I want to buy the book and join in! Love your pin cushion. Love this tute! Your pincushion is so cute and I love your idea of caving your own stamp from an eraser . I'm going to try this too .thanks for the chance to win the Aurifil threads. Oops meant to say carving ! Love your sweet pincushion Ayumi! And how amazing is that stamp you carved?! Such tiny details! Let me know if you ever plan to sell some! Ayumi, The pincushion is wonderful! I love that sewing machine stamp too, I collect miniature machines and I'd buy one just for owning it, even if I never stamped, it's so cute. Your stamped tape looks pretty good to me. Nice giveaway, please put my entry into the drawing. And thank you. I'd love to enter your giveaway! Thanks for the chance. When I stamp either fabric or twill tape, I first iron it to the shiny side of a piece of freezer paper. This keeps it flat and smooth and also protects the table surface underneath if the ink goes through the fabric. I think your stamp on the tape looks great. I like the texture. I love your stamp - and I still think it looks great on the tape. The stamp is really cute, must be difficult to do such detailed work. Anyway, this is me entering the giveaway! That is super cute and I use glue sticks all the time too. That is gorgeous! I didn't do the stamping, kinda forgot! Never mind, I still enjoyed making it. I am LOVING the sewalong! Great tips for the pincushion! I hope to start mine today. I love your carved stamp. I have done that before, but not for quite awhile. I think you have inspired me to dig out my tools again!! Love this post...the new pincushion is adorable, and I love the tips on stamping and stitching. I even thought the stamped tape turned out great! I hope it didn't land in the trash can or anything. This is probably my most favorite project in the book, and I can't wait to see the new ones you inspire! Thanks for the super tips! Your pincushion is just lovely! It is so lovely. And thanks for the great tips. Oh, and I think I might have to stop by the library today to get a book on carving stamps! The pincushion is very sweet. Thanks for the giveaway. Thanks for the tips on the rubber stamping. I was hoping you'd have some tips for us. What a cute pincushuion wit a combination of linen/linen coloured fabric and a very cute pink fabric and lace ans a little embelishment.Thabks for the goos tutorial. Ayumi! You must share your eraser-carving tips! :D I was really into that a few years back, but haven't really picked it up again that much. Do you use those carving tools? Or a knife? I'm inspired - by both your adorable pin cushion and by your stamp carving. I've tried carving stamps and I'm not so good at the moment. I guess I just need to practice! I think that the stamp looks adorable on the tape! I also enjoy seeing your creations. Thanks for sharing and for the giveaway. Such a simple and adorable pin cushion! Very cute pincushion and I love your stamp! I would love to read a blog about how you make them. Thank you for you tips, Amy! Love the idea of making your own stamps. That must be teeny tiny work. Beautiful! I finished the button for my pincushion (stitched it) and now have to find the right fabric to it. Some great tips there Ayumi, especially using the temp adhesive on ric rac etc, it can misbehave sometimes! I have my pincushion done and will link later today. I haven't tried stamping yet but have just bought my first ink pad and mini alphabet for another project so raring to go. This is such a fun sew a long. Looking forward to making my first pincushion! Thanks for the tips!! Thanks for the great tips there Ayumi !!! The glue tip is a winner. So is the cute goat. Your handmade stamp is amazing! I can't believe you carved that little stamp! Such detail. Nice one for my growing pin cushion collection! Thanks for the tips - very helpful!! And darling pin cushion, of course! Darling pincushion and I just love your little stamp. As usual, your work is gorgeous. Your Pin Cushion is adorable! Thanks for the chance to win! I have ordered this book and apparently it's on the s-l-o-w boat from Amazon. Maybe it will arrive this week! Neat stamp, and great idea about using the glue to temporarily hold things in place. Very cute! Thanks for the helpful ideas. I'm going to get to work on mine soon! I am loving the book. I have it and working on some of the projects! Love your blog! The pin cushion is adorable! Would love to win some Aurifil thread. Thanks for the chance. I have to return this book to the library, but cant get it at a good price anywhere right now. I love it, but full price isnt my thing. I am having fun with the sew a long..
i love your pincushion! i'm addicted to carving my own stamps too! 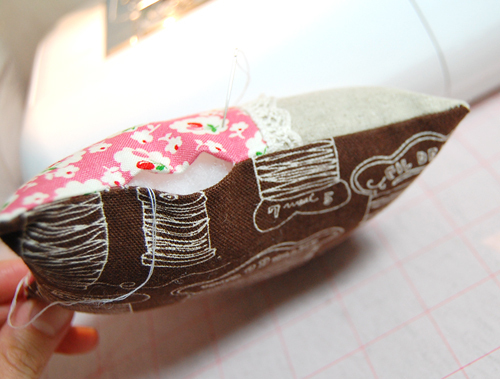 i love the button you chose for this pincushion (instead of the fabric covered one like in the book)! i'll have to get out my pretty plastic buttons too! they really have been sitting waiting to be used for too many years now. Like all your projects! Thanks for the chance to win! 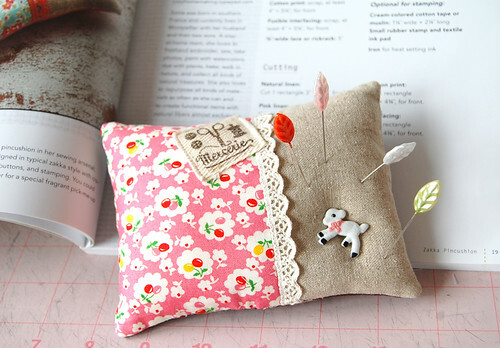 thank you so much for the tips on making this pincushion....it is adorable! What a lovely pincushion! Thanks for the chance to win! thanks for the tips and the giveaway! Would love to see the eraser stamps you've made! Very, very cute pincushion- you can never have too many pincushions... at least if you're like me, who started off the yaer with 100 pins and now has about 15. Where do they all go? Your pincushion is very sweet and I'd love to see more of your carved stamps! That would be really fun to make. Thanks for sharing and I really loved how you are making stamps. I have never even considered doing that and it is such a great idea!! Thanks for the giveaway :)!! Thanks so much for the great tips, Ayumi! The stamped fabric tape adds a lot of character and you've really encouraged me to give stamping a try! 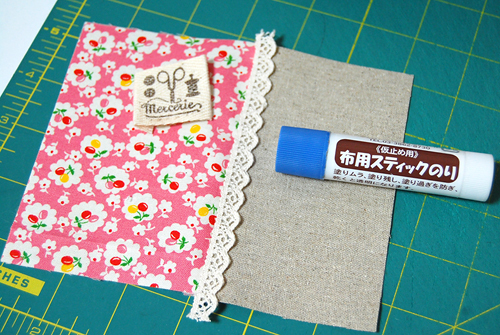 I've been waiting for a Zakka project I know I could finish with my currently crazy schedule. Yay! Thanks for the lovely tips! Whoo hoo, something I can actually finish in time to "sew along"! Thanks for the tip about the glue and the chance to win! Cute pincushion! And I love that stamp you made - adorable! Your pincushion is great! I can't wait to make one, too. Very cute! Love finding new crafty blogs! 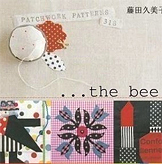 Cute pincushion--you have such a good eye for pattern & color combos; it always inspires me. Your stamp looked good on the linen and the cotton - very impressive. I was stalking your blog all day for this post...just wondering what stamp lovely you would do. Thank you for including some tips and photos for the visual learners amongst us. I wish we had started the Sew-Along with this nice easy project! Cant wait to finish mine, no camera so I judge myself & ones that we can see. Silly but exciting. This is one I collect (pincushions). You have a lot of talent out there. Congratualted Kate #13 winner. See you in a few days I hope. I love your little stamp! It is really fun. Love it! Your stamping issues have everything to do with the bumpy twill tape and nothing to do with your stamping skills, LOL! Great looking project and really good tips! 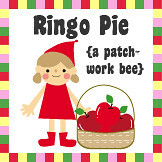 I would love to see more of your handmade stamps, that sewing maching one is super cute! Maybe a future blog post can be showing us all of your cute stamps! Oh your goat is so cute now he has his freedom, although he now has to avoid the pins! The carving looks great - nothing wrong with a rustic 'edge'. Thanks for the great tips and for the giveaway! What a cute pincushion - but I am seriously in awe of your fabulous carved stamp! You must show us some more of what you've been carving lately. Adorable! You are truly so talented Ayumi! Thanks of the chance to win. After seeing your blog post I hauled out my Zakka Style and made three pincushion. Thanks for the inspiration. a realy nice pincushion ,i have some little stamps and together there are a super idea for gifts . excellent tips ayumi! love this pincushion so much! i really need to get some stamps and some versa ink and start making my mark! I am so excited to participate in something fun i loved making the house pouch and am going to work on this pin cushion tonight. I also am addicted to the patchwork wristlet i have made 3 already what a great way to use up scraps. I love this pincushion and the sewing machine stamp is so sweet. cute pincushion. Love the little goat. Love you pin cushion and also you blog. Thanks for a chance to win something great. Ayumi....I love your pincushion. I absolutely love your sewing machine stamp! You made this? You are so talented! Do you have any for sale? to make these. What a wonderful giveaway! I love your little pincushion.....can't wait to do mine! Cute pincushion especially with the added stamp! I'm impressed with your hand-carved stamps. That art form interests me too. The sewing machines on the fabric tape look just fine to me! Thanks for the chance to win some Aurifil. I've yet to try it but am dying to! Very every cute pincushion! Thanks for the giveaway opportunity! I would love to win! Thanks for sharing your tips - very helpful. I can't wait to find some time to rummage in my stash for something unique to make my special pin cushion. 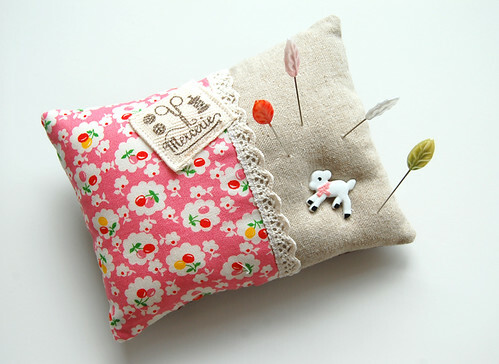 Super awesome giveaway :) your pincushion is darling! I am new to quilting, and I have not tried this brand of thread. What I have read about the tread it is good. I will try it in the fulture. If you guys use it is must be good. Thanks for a chance to win some. Your style is so cute, love it. Oh, I have tried this thread and loved it better than others I used. Love the sewing machine stamp, by the way! I love the pincushion! So cute. I always love your fabric choices Ayumi! Thanks for the Tips, and the chance to win! Adorable pincushion! Thanks for the giveaway too! Ooooooh, thank you for giving me ideas, Ayumi! I´ll try to make one myself soon. Maybe, if I am lucky, with some of your AuriFil? This is so cute Ayumi! And you are totally rocking the hand carved stamps! I still have the car able stamp thing you left me but I've been too scared to give it a go. Mostly because I don't have your drawing talent! Thank you for all your tips and advice. I do like your pin cushion. I love the button you've used! I wish I'd read your post before making my pincushion as I tried to pin my lace and it slipped as I was sewing! Adorable! I love the pink fabric in your pin cushion! What colorful packaging on the thread! And I LOVE your stamp....haven't carved in a while....should pick up the carving tool again!! The pincushion is very cute. I definitely need to make one for my sewing room. Thanks for a great giveaway! I was so excited about doing this project that I started it on Sunday! Love yours ~ so sweet. Thanks for the giveaway ~ awesome! thanks for the tip on the glue stick! i used it for mine and it worked wonderfully! i would love to try some of this thread as well! Wow, you always share some thing interesting and creative, no-doubt your posts are very helpful to learn about new things can decorate our home. Oh my gosh. Sew super cute. I thought that button looked more lamb. But either way it makes it special. I can't believe you carved that wee little sewing machine. And your pin cushion is so cute, too. Hey Ayumi! Long time no chat. Your pin cushion is of course lovely. I have a tip for your fabric stamping. I love the "carvability" (such a word??) of the erasers but the rubber is not very flexible on textured fabric. Another way to make stamps is to cut the designs out of craft foam - not as detailed as the carved erasers unfortunately, but they seem to press a lot more ink into the fabric as they have more give. I use a scalpel to cut the foam and then I glue it onto a firm base - whatever I have handy at the time. You can see a few I did on my blog in my "Fabric painting" category. These were quite big ones. But if you want little ones it can work too. They just can't be quite as detailed as your fabulous sewing machine. What an adorable little pincushion! The lamb button is too cute, too! You are very patient, to be able to carve out designs to make your own stamps! Thanks for the chance to win the Aurifil ! I'd love for you to show more of your carved stamps. It's the sort of thing I admire but am terrible at. Stamping on tape can be a bit tricky, but it is a bit easier if you use some temporary adhesive to stick the tape down on a firm surface (I use double-sized sticky tape). Next, pounce the stamp onto the Fabric or Stazon ink -- don't press it down onto the pad. When it is good and covered with ink, blow on the stamp before you make the impression. The slight moisture in your breath makes the ink a bit stickier. Apply a firm pressure, but don't wiggle the stamp. Lift it up straight up from the tape. It should look pretty good. I heat set the image, once it is dry, by ironing it with a dry iron. You're clever carving that little stamp. I love the colours of the sewing threads, thank you for the giveaway. 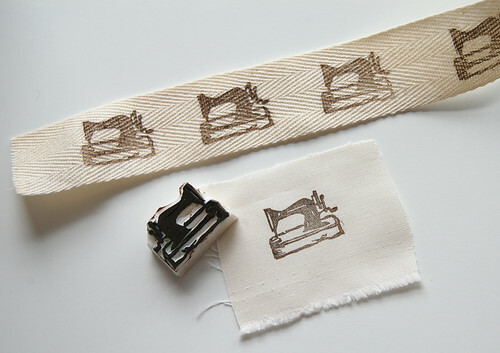 Wow - that sewing machine stamp is very cute. I've tried stamping on that type of tape and if it's any consolation, mine wasn't even as good as yours:-( Thanks for the give-away. I love the sewing machine stamp that you made. This really inspires me to get an eraser, cut, and stamp away. Thank You. That pincushion is almost too cute to stick pins in. I love the lace on it. Thanks for hosting this part of the sew along. I would love to win the give-away. fantastic tutorial! Have you ever seen a stick glue for the fabric in USA? what a cute pincushion, and ♥ the sewing machine stamp. So glad to stumble across this today - my zakka style book arrived on Monday and I have a day off today :) guess what I'm going to be doing?! I love the button on your pin cushion! and your carving of that sewing machine for the stamp is amazing!! This is my first week of joining in with the sew along!! Can't wait to get started! Love this! Off to buy some lace to make this! I have been having a blast with this sew a long. Thank you for the opportunity to win some aurifil thread. I haven't tried them yet. Cute -- thanks! I think this may be the week I jump into the sew-along -- I do love that pincusion! I like the sewing machine on the twill tape. 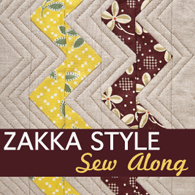 My library copy of Zakka Style should be in my hands soon. I've seen it on-line and love the projects. I will have to see if I can detrack from my purse frenzy to sew some of the projects on this sew-a-long. Thank you for your tips on using fabric glue and the q tip. Thanks you for the chance to win. I've made my pincushion today :-) Also looking forward to trying aurifil, I've heard a lot of good comments about it. Your pincushions are always so georgeous! Thank you for this! I love your pincushion! Fun way to use up little bits trim. Also I've heart that the Aurafill thread is really nice...but I've never had the privilege of working with it. I found your blog and the SAL sounds great. Will come back for have a more closer look soon. Thanks for the chance to win the Aurifil garn which I would love to use. ooh, what a nice giveaway! thanks for the chance. I love your pincushion- especially the spool fabric! Thanks for the tips! and thanks for the giveaway! This is my first time here, Contemporary Cloth sent me from Facebook. I just have to say WOW, great fabric stash! I love all the cute bits of fabric in your pincushions. If I could afford more Japanese fabric, I would buy it in great yardfulls ;) Right now I only have a few, mostly with Russian motifs/matroyshkas (nesting dolls), since my husband is Russian. I have to try my hand at carving stamps, too. Thanks for sharing! Awesome post...so full of great ideas and tips! Thanks very much for the chance to win. I'm off to try and make a pincushion!